Taking a break from tweeting energetically in support of gay marriage, Lateline compere Emma Alberici has provided a pithy explanation for her show’s cancellation. The stated reasons are that it has passed its use-by date and can no longer pull a worthwhile audience — a grim fact diplomatically expressed by ABC in-house apologist Gaven Morris as a consequence of “changing viewer habits”. Actually, viewer habits haven’t changed at all. Boring, predictable, laughably biased fare has never been a marquee attraction and it doesn’t get any more predictable, laughable or biased than Lateline. 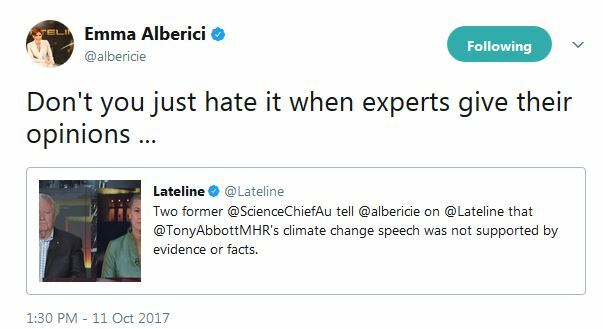 Take the show’s assault on Tony Abbott’s most recent thoughts on climate change, which prompted Ms Alberici’s tweet reproduced above. Know that Lateline had two seats available for guests to discuss Abbott’s address. So how did the bookers fill them? By recruiting two former chief scientists — Ian Chubb and Penny Sackert, each an ardent warmist — to opine at some length that the former PM is a dill. Why not host just a single former chief scientist and bring in a sceptic, Ian Plimer for instance? That might have made for some genuine excitement, the sort of thrust-and-parry conversation to stop viewers reaching for their channel-changers. But this is the ABC we’re talking about, so no chance of that. Instead, as Alberici’s smug little tweet indicates, it was only the catastropharian narrative the ABC favours that received an airing. “Experts”, you see. And such experts! we have about five years to avoid the dangerous climate change that would be generated if average global temperatures increase by more than 2°C above pre-industrial levels. EMMA ALBERICI: Penny Sackett, what Tony Abbott says is more people die in cold snaps than in heatwaves. So to the extent that the temperature is rising, it’s a good thing. So something “not supported” by “the facts” is probably “true”. Climate science, settled or not, is a genuinely wondrous thing. But Ms Sackett was only warming up, so to speak (emphasis added). … we also know that in the last decade the number of heat deaths has gone up by a factor of 23 over the decade previous. A “factor of 23”, this expert says. Translated, what Ms Sackett would have you believe is that global warming is killing Australians at 23 times the rate they were expiring before the expert establishment discovered that climate change is a bonza grant magnet and career enhancer. So where did Ms Alberici’s expert guest find that shocking, we-must-act-now factoid? Most likely here, in a Climate Commission paper by the three mush-keteers of climate science, professors David Karoly, Matthew England and Will Steffen (follow the links for more on their prognosticative achievements). During the Brisbane heatwave of 7–26 February 2004 the temperature ranged from 26°C to 42°C. Overall deaths increased by 23% (excluding injury and suicide) compared with the death rate during the same period in 2001–2003 when the temperature ranged from 22°C to 34°C (Tong et al., 2010). So, if that is indeed the source of Ms Sackett’s claim, her “factor of 23” is a misquotation and an exaggeration by, as she might put it, a factor of 92. Both deaths and death rates (per unit of population) fluctuate widely but show an overall decrease with time. Interestingly, the Karoly, England and Steffen paper notes that, when we do see an eruption of heat-related deaths, it is the elderly and poor who suffer most. Given that the latest thrust of Turnbullian climate policy is to ask that air conditioners be switched off during heat waves — free movie tickets if you do! — it is now official policy to encourage more suffering, and presumably more deaths, to protect the windmill-plagued electricity grid’s stability. Perhaps Alberici was thinking of her next tweet and thereby missed the opportunity to ask her guest if she sees anything bizarre in forcing up the cost of power to safeguard the planet from the ravages of climate change while simultaneously putting the lives of pensioners and babies at greater risk from that same climate change. Lateline‘s second climate expert, the neurologist Ian Chubb, appears also apt to quote grossly inaccurate numbers. In his case it was his citing of the artfully crafted furphy that 97% of climate scientists believe wholeheartedly in anthropogenic climate change. Yes, despite that claim having been systematically demolished, not just once but again and again, Lateline‘s Expert #2 is still parroting it. And Ms Alberici let it slide into the conversation without qualification or comment. Ms Alberici’s next gig at the ABC will see her re-cast as the national broadcast’s chief economics correspondent, which is a bit of a worry. Economics, like alleged climate science, involves lots of numbers and more of those experts before whom she genuflects. Roger Franklin, the editor of Quadrant Online, and has just paid a $940 quarterly electricity bill — the cost of saving the planet, experts say. I wouldn’t think Alberici would genuflect before anybody who eats a four square meal three times a day!! You haven’t noticed how thin she is? Oh, okay. I haven’t laid eyes on the woman for many years. The last time I saw her, was a head and shoulders shot of her doing the Barnaby Joyce is nuts reaction. It was by pure accident that I saw her then, because I take very grat care never to watch or listen to the ABC, least of all its “current affairs” trash. 23% = a factor of 23! From a “scientist”? And laughably a “chief scientist” at that! Wow – no wonder we are producing whole new generations of utter dills. I can only think of two alternatives to explain the general dumbing down of an entire nation. Either way, it doesn’t look promising. he he …centuries of inbreeding ‘to’ achieve….. Enter our Resident Troll from Left Stage quoting sea level rise by the UC, that we deniers of the Cult is all shills of big coal (I wish I was) and NEVAAA answering or any questions put to him – or providing any measurable facts testable against a hypothesis (the basis of the Popper scientific method). Ian won’t be promoting the sea level rise any longer. He’s seen the NASA data and the graph from the satellites. 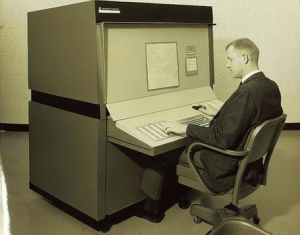 There is absolutely no way that data can be fiddled. When were facts and reality EVAAA a problem for any cult? Falling sea levels are a huge undeniable (huh and there’s a new word) fact for Ian. No answer to the facts now eh Ian.? Here’s Judith Curry’s opinion, and she would know as well or better than anyone. I doubt Ian Mac will be impressed, but others here might be. 48 hours and still nothing Ian! As I have said many times before, AGW just could not possibly be happening; proof: because if it was, it would be bad for established business, and particularly for the coal business. That appears to be the reasoning that drives the pro-coal and anti-renewables shills who opine around here. But every palace on the slide these days needs its Rasputin, and the ex-monk T. Abbott has filled that role here at QO for ages. Except that at the moment he is reportedly modifying his theology. AGW, climate change or whatever you may call it may be ‘crap’, but is now perhaps a GOOD THING, because it will prevent people from freezing to death, and will improve crop yields; or whatever. Theology is wonderful, because its expert practitioners, who clearly make it up as they go along, display such ease as they do so. The Mad Monk is world class, though we should always stand by to receive further modifications. For example it might be that CO2 traps heat, but only on Mondays, Thursdays and Saturdays, and with double effect on Shrove Tuesday.